The “chakka jam”, the call for which was given by the joint action committee (JAC) of the Haryana Roadways Employees Union, evoked a mixed response as bus services remained paralysed in many districts, while in others the services were affected partially. The strike call was given in protest against the “privatisation” of the bus services in Haryana. In Rohtak, the police allegedly cane-charged protesting employees, resulting in injuries to many of them. Thousands of people paid homage to former Chief Minister Bhajan Lal at a condolence meeting held at his residence here today. Prominent among those who attended the meeting were Chief Minister Bhupinder Singh Hooda, Rajasthan Chief Minister Ashok Gehlot, RK Dhawan, former Union Minister P Shivshankar, MP Ashok Tanwar, Kiran Choudhry, Ajay Singh Chautala, Ashok Arora and Hari Singh Saini. All leaders signed the condolence book. The Indian National Lok Dal today demanded a CBI inquiry into the double murder case at Ellenabad alleging that the district police’s role has been dubious from the day the woman and her granddaughter were found murdered in their house on May 5. After Punjab, Haryana too will implement a scheme to ensure time-bound delivery of services to citizens. Chief Minister Bhupinder Singh Hooda announced today that initially 15 services would be made time-bound from June 21. The DCs would monitor the performance of the scheme on a regular basis. Enraged villagers and kin of former sarpanch Karam Singh, who was murdered here yesterday, lifted the road blockade and dharna at Committee Chowk and allowed doctors to conduct a postmortem following an assurance from the police that action would be taken against the guilty within two days. The state’s “demanding” MLAs today ended up getting more than they had asked for. The “magnanimous” government which accepted the MLAs’demand for free laptops and printers has “gifted” them fax machines and scanners as well. The Haryana Federation of University and College Teachers Organisations (HFUCTO) has demanded uniform implementation of new pay scales for teachers in all states. The Punjab and Haryana High Court has directed the state of Haryana to complete the process of confirming masters, lecturers, headmasters and principals, who have completed the probation period. As many as 72.85 per cent candidates have passed in the senior secondary semester examination of the Board of School Education, Haryana, held in March. The pass percentage of private candidates is 71.47. Giving credence to reports of alleged intimidation and threatening of activists seeking information, a local resident has been booked after he had an oral argument with an official of the Municipal Council in connection with the inspection of the records of the council in response to an application filed under the RTI Act. The “chakka jam”, the call for which was given by the joint action committee (JAC) of the Haryana Roadways Employees Union, evoked a mixed response as bus services remained paralysed in many districts, while in others the services were affected partially. The strike call was given in protest against the “privatisation” of the bus services in Haryana. In Rohtak, the police allegedly cane-charged protesting employees, resulting in injuries to many of them. About 400 of the striking employees were reportedly rounded up by the police. The authorities on the other hand claimed that many of the buses plied as usual. Private operators were seen cashing in on the situation by charging exorbitant fare and risking the lives of passengers by overloading vehicles. The passengers were at receiving end at Jind where a majority of the maxi cab operators also remained off the road. An official spokesman described the strike as “a total failure”, but admitted that the services were partially affected in Faridabad, Hisar, Jind, Panipat, Yamunanagar and Kaithal depots of the roadways. He claimed that the Delhi, Sonepat, Ambala, Sirsa, Bhiwani, Rohtak, Jhajjar, Gurgaon, Narnaul, the ISBT, Delhi, Fatehabad and Rewari depots were fully operational. The spokesman said till 10 am, 1,065 routes were operated. A large number of employees across the state reported for duty. Meanwhile, the state CPM has supported the strike and has sought discarding of the present transport policy. The party has also demanded the sacking of Transport Minister OP Jain. 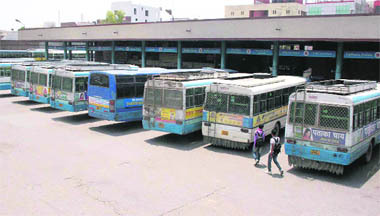 In Gurgaon, the strike call evoked a lukewarm response in the district and nearly all buses of the Gurgaon depot plied to their destinations as usual. A local court had yesterday restrained activists of the Haryana Roadways Sarv Karamchari Union to hold demonstrations within the radius of 200 metres from the outer periphery of the roadways depot, workshop, offices and other premises of the Haryana Roadways. The strike call was a complete success in Rewari. 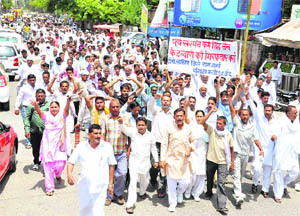 The strike call evoked a mixed response Fatehabad and Sirsa. A Fatehabad court had restrained the employees from holding demonstrations in the vicinity of the local depot of the roadways and also from forcing any worker to strike work. Meanwhile, tension mounted at Tohana, when a striking worker allegedly threw black oil on a bus driver, who was plying the vehicle. Bus services in most parts of Ambala district were hit today. Even as officials claimed that skeletal services were maintained and buses plied on some important state and inter-state routes, people were stranded at various bus stands. The bus services in Kaithal district also remained paralysed and the passengers had a tough time as they had to use various other modes of transport to reach their respective destinations. The strike call evoked a partial response in Sonepat. The bus services in Panchkula district were paralysed due to the strike. None of the 100-odd buses of the Panchkula and Kalka depots were allowed to ply by employees, who staged a dharna outside the inter-state bust terminal in Sector 5. Thousands of people paid homage to former Chief Minister Bhajan Lal at a condolence meeting held at his residence here today. Prominent among those who attended the meeting were Chief Minister Bhupinder Singh Hooda, Rajasthan Chief Minister Ashok Gehlot, RK Dhawan, former Union Minister P Shivshankar, MP Ashok Tanwar, Kiran Choudhry, Ajay Singh Chautala, Ashok Arora and Hari Singh Saini. All leaders signed the condolence book. The “paani dhal” ceremony was held in the morning during which all those present were served “halva” and black gram as “prasad” as per the Bishnoi traditions. Several thousand supporters and kinsmen of Bhajan Lal partook of the “prasad”. This was followed by the condolence meeting. 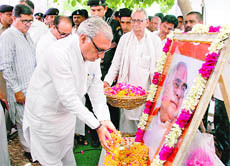 Chief Minister Bhupinder Singh Hooda said he had a warm personal relationship with the late Chief Minister and they had worked closely on party affairs so long as the late leader was in the Congress. He said Bhajan Lal would be remembered for his service to society. The party has also demanded immediate transfer of SP Satinder Kumar Gupta. Talking to mediapersons here, Abhey Singh Chautala, INLD MLA from Ellenabad, alleged that the district police had been beating about the bush since May 5, but suddenly found a culprit in Subhash, a “muneem” with Ashok, whose mother and daughter were murdered, once the INLD announced its decision to organise “Sirsa bandh” on June 11. Chautala alleged that the police was hand in glove with criminals in Sirsa, leading to a surge in the criminal activities. The INLD leader said the INLD would stage a demonstration and organise “Sirsa bandh” on June 11. Meanwhile, the police today said the investigating team had recovered the clothes of Subhash, which he wore at the time of committing the crime. Subhash would be produced before the court tomorrow. Kin of Subhash Chander, who has been arrested in connection with the double murder case, failed to keep date with mediapersons after inviting them on Tuesday. Subhash’s father, Sat Pal, and a woman Congress leader from Ellenabad invited mediapersons to a local conference hall, but failed to turn up there. A new ration card would now be issued within 15 days whereas a new ration card on receipt of a surrender certificate, duplicate ration card and inclusion or deletion of family members would be done within seven days. The surrender certificate would be issued the same day. The certificates of SCs, STs or OBCs and a certificate of residence or domicile would be issued within seven working days. A learner’s driving licence would be issued within five working days and a permanent driving licence and registration certificates of light vehicles within seven working days. Hooda said a new electricity connection, temporary electricity connection and enhancement of electricity load would be done within 30 working days. The land deeds would be registered the same day. Sanction of mutation of land and copies of land records would be provided within five working days. A new water and sewerage connection would be released within 12 working days. A birth or death certificate would be issued within three working days. A building plan would be approved within 25 working days. Hooda said a check-list of documents or other prerequisites for making an application for grant of each service would be prepared in English, Hindi and Punjabi. Officials would be designated for receiving the applications. The official concerned would issue a receipt to the applicant, indicating that the application complete in all respects had been received and the service sought would be delivered by the target date. The villagers were demanding an FIR against the Transport Minister and the Chief Parliamentary Secretary in connection with the murder. The impasse was resolved after a 21-member committee of protesters had prolonged talks with the police. Rajinder, son of the deceased, had mentioned the name of Transport Minister Om Prakash Jain and CPS Zile Ram Sharma in his complaint. The postmortem was conducted today and Karam Singh was cremated after over 30 hours. Rajinder claimed that Karam Singh had sent a written complaint against the duo to the Chief Minister, the Karnal SP and the Panipat DC, alleging that they had taken Rs 12.45 lakh from his father to provide jobs of constable (Rs 4,95,000), clerk (Rs 4,95,000) and conductor (Rs 3,00,000) to three persons. Suspecting political hand in his father’s murder, Rajinder sought the arrest of the accused politicians. IG (Rohtak range) V Kamraj said the police was making investigations into the case and assured that the guilty would be brought to book. He said six suspected persons had been identified. The postmortem report is awaited, but preliminary observations suggest that the scars of pricks on the body were not off a syringe and there was a possibility of toxic substance in the body. The FSL team did not find any traces of blood at the crime scene, but detected traces of pesticide in the vomit of the deceased. What’s more is that the government fulfilled this wish in just over two months at a cost of nearly Rs 5.45 crore. Each “set” comprised a “loaded” DELL laptop, printer, fax machine, scanner and a pen drive, among other things. Speaker Kuldeep Sharma presented the first laptop to Chief Minister Bhupinder Singh Hooda . The former was “gifted” his laptop by Hooda after which a few ministers and MLAs present at the venue were gifted their “sets” by Sharma. Parliamentary Affairs Minister Randeep Singh Surjewala said though the demand for a fax machine and a scanner had not come from the MLAs, the government decided to go in for the complete set because the price difference was “minimal”. While the government has given its MLAs reason to cheer with the “add-ons” to their wish list, the Speaker’s office is actively pursuing their other demands raised during the budget session this year. It may be mentioned here that the MLAs had got a hike in their salaries and allowances in the last session. The government has enhanced the rate of dearness relief payable to the pensioners or family pensioners of ex-MLAs from 103 per cent to 115 per cent of the basic pension or family pension with effect from January 1. In keeping with the demand for more MLA flats, the Speaker’s office, which had been in constant touch with the Chandigarh Administration, has been informed that two “pockets” are available for the contruction of new flats adjacent to the existing ones in Sector 3. While one measures .7 acre, the other is a .74-acre piece of land, available at a cost of Rs 28900 per square yard. Dr Pradeep Chauhan and Attar Singh, president and general secretary, respectively, of HFUCTO, said here today that several states, including Haryana, had not implemented the UGC notification in toto. The directions came on a petition filed by Ramesh Malik and Narender Kumar. The court observed coincidentally the petitioners in both cases also seek their own confirmation in service on the ground “they are similarly situated as a large number of persons on whose behalf the present public interest litigations have been filed”. Referring to a reply filed by an Assistant Director, School Education, Haryana, the Bench observed: “It has been stated that by an order dated February 10, the services of 373 principals have been confirmed and by another order dated January 24 similar confirmations have been made in respect of 511 headmasters. The bench concluded in view of the state’s stand both petitions are being disposed of by ordering the completion of the confirmation process after due verification. The results will be declared tomorrow. Girls have outshone boys and have a 17 per cent more pass percentage than the latter. The board secretary said the results could be downloaded from bseh.gov.in, hbse.nic.in and www.indiaresults.com from 7 am onwards tomorrow. The activist identified Ravinder Singh Rathi has been booked under Section 506 of the IPC on the complaint of the vice-chairman of the local civic body. Describing the lodging of the FIR against him as a tool to intimidate him, Rathi, who has filed several petitions regarding the functioning of the civic body in the past, claimed that the development follows an inspection by him under the provisions of the Act as the MC official not only abused him, but also lodged a false complaint against him. Alleging that the vice-chairman of the civic body threatened him with dire consequences, Rathi said the lodging of an FIR against him was an attempt to threaten him and put a pressure on him to withdraw his RTI application. He had filed an application seeking details of the maps of the buildings approved by the Municipal Council after reports of serious irregularities in the work. Rathi claimed that he had all the audio and video recordings of the incident, in which the complainant had threatened him and directed the officials to throw him out of the office of the civic body during the inspection programme. Rathi had gone to scan the files of the building plans on June 2. Though the clerk handed over the files, informed vice-chairman of the civic body Dharamvir, who stopped him from scanning the files and threatened him.